So I have a confession to make, I have recently fallen deeply in love with a spice ground Coriander. 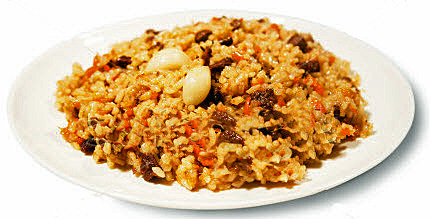 The love affair started when I decided to make a new recipe – Uzbek rice pilaf with chicken. I am not big on using spices in my cooking, but was pleasantly surprised to find coriander irresistible. By the way, this dish can be made with meat, fish, and even vegetables and mushrooms for the vegetarian folks out there. The list of ingredients contains approximate measurements, feel free to add more or less depending on your taste. Check to see if the rice is tender, if not, add a little more water. After the rice is ready, still not stirring, cover the pot and let sit for 30 minutes – this ensure that the rice is nice and fluffy. Finally, you can stir the rice before serving.